The StingRay 3EQ Bass Guitar from Music Man is constructed from an ash body and maple neck to offer a warm thick tone with thick firm lows and melodic yet punchy highs. 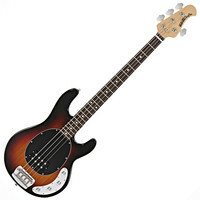 With a rosewood fingerboard Music Man humbucker pickups and a 3-band active preamp Music Mans StingRay Bass offers style with quality and control perfect for any experienced bassists collection. This entry was posted in Music Man and tagged Guitar-and-Bass. Bookmark the permalink.